In 2018, AEC (ASEAN Economic Community) agreement will be implemented. There have been changes and upgrades in many sectors in Thailand preparing for the new frontier. Educational sector has been as well adapting itself rapidly to be able to compete in the new condition. One of the the strategies of Bangkok University is to equip their students with more knowledge and skill that will allow them to understand cultures of different countries in AEC better so that the possibility to do business or cooperate in the future is more fluid. The BU international Center is a 480 sq.m. space converted from a typical student hall situated in between an existing movie room and lecture hall. The programs consists of reading area, I.T. corner, Movie room and 2 workshops. The design is to increase interaction among students as much as possible as we think interaction between teachers and student and among students themselves is the most effective way of education. The majority of the programs are in one space without partitioning, except those for particular workshops. The front partition, nicked name: “SPUN WALL”, is a curved wall consists of 1,360 pieces of metal panels painted in 16 shades of colors. The gradient steel curtain is a see-through facade of BU International Center separating the facility from the public corridor. 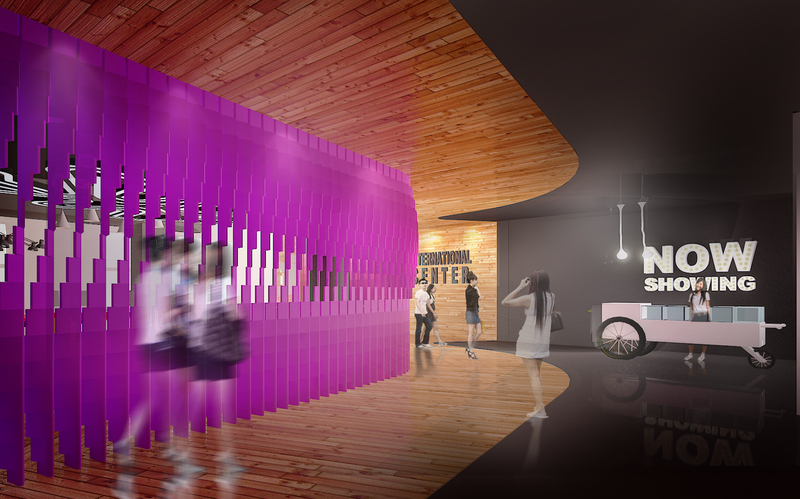 Walking along the Spun Wall, people will be able to see through the interior with different angle. It is a wall with thousand of windows. In the facility, there are some elements derived from ready made objects in Thai culture including the 4-leg table made of the clothing mannequin and the reception counter in the shape of typical Thai fruit kart. These fun elements are important to us for the educational facility to drag it out from a typical institutional atmosphere. We have been developing series of educational facilities for Bangkok University, whom we have completed BUCC and IMAGINE LOUNGE for. One of the recent projects that will be under construction soon is Bangkok University International Center. It is a facility mainly to prepare the students for a broader communication with ASEAN community in 2015.